I’m dying for spring. I want sunshine, flowers and cherry blossoms, but that’s not going to happen for a while. Luckily I found some (not too expensive) strawberries at my local mart, and decided to get a taste of spring! Strawberries have loads of antioxidants, and are really high in vitamin C (1 cup holds 114% of your recommended daily intake) They really are one of my favorite fruits, but then again I say that all the time. 🙂 And, as for the spinach, there is no need for me to go on about its health benefits, it is a superveggie! 1. 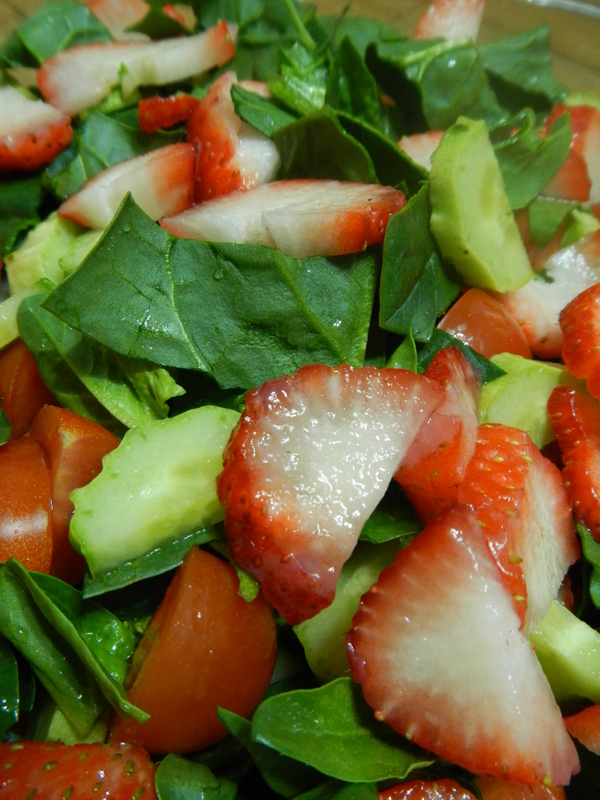 Cut the strawberries, tomatoes and cucumber into small slices or pieces. Wash the spinach, remove the ends.